This is going to be a series of success stories of our personal training clients. It is in no particular order but I feel like the success they have had and the work they put in should be honored. Tammy wrote me for the first time in December of ‘12. She made it very clear that she wanted to check my credentials and make sure that we were a good fit. If yo u meet her you will see she knows exactly what she wants. She was planning on having surgery for an injury that occurred while training for the Marine Corps Marathon that year (she did finish it), and wanted me to help her get back to training for the marathon again in 2013, but this time running it all the way through. The initial consultation was a meeting of the minds. Tammy was very outspoken, voiced clearly what she wanted and had a great sense of humor. She was determined. She clearly rejected any idea of failure and is going for it. During the consultation we found a couple of movement issues that lead to her injuries aside from a nasty fall during one of her training runs. We decided to go ahead and start with the personal training. She wanted to come in 3 days a week, which was optimal. After her surgery we started working closely together with her physical therapist in order to optimize the rehab process. We were lucky since they only had cleaned out the knee and the recovery was fast. Soon the knee that had undergone surgery was doing better than the other one that had severe arthritis. Her training was a consistent whole body training with a focus on post rehab, optimizing her nutrition to get her to the ideal race weight, and reduce stress on joints. In March we decided to pick up running. I had told Tammy she needed to change her running style. She was a classic heel striker with a relatively low cadence. We switched over to a fore/mid-foot strike and going for a cadence of 180 steps/min. The running started with a walk/run routine that progressed to run/walk with shorter and shorter walking intervals. The progress went well and we started working with Dr. Nevin Markel of Performance Rehab Associates in order to work on some lingering soft tissue issues and support the training progress. In May, while I was on vacation she had started to go off the reservation. Thinking that she needed more running than I had planned, she added more running into her existing training plan. When I came back from my vacation she was set back by 2-4 weeks. Joints and muscles were achy and she was not moving as well anymore. Not giving up, Tammy recovered quickly and again we made good headway. The training went great and she was stronger, faster and leaner than she ever had been before. She was not hungry despite the changes in her nutrition and the fat loss. She had gone from 196 lbs to 170 lbs and gained several pounds of muscle mass. 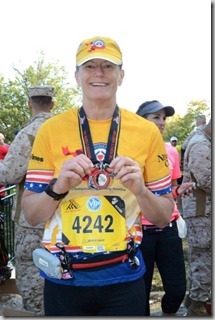 By the time the Marine Corps Marathon came around in October, she was ready! She ran the race and finished it 45 min faster than the year before, and had a good time doing it! After the race she was not sore beyond day 2 and had no injuries. After the race we needed to slow down. Having a long structured training plan is hard. It is really important afterwards to have an easy time, just playing, training for fun, working on some things that had been neglected in the race preparation. 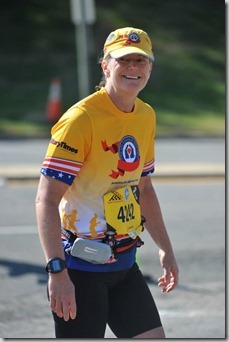 Tammy has decided to run a couple of shorter races but she already mentioned that she wants to run the Marine Corps Marathon again. Her nutrition is still on point. She is down to 165 lbs., has gained 6 lbs. of muscle mass and is at 16.38% body fat. Last week she was able to do her first unassisted chin ups and she did 3 in a row, twice, because I forgot the camera the first time, haha. I am so proud of what she has accomplished, the focus, the drive and the balance. She did not let anything deter her. It really has been a pleasure to work with her and I am looking forward to continuing to train her. I know Tammy personally and know how dedicated, determined and outspoken she can be (lol;-). She will strive to complete anything she sets her mind to and will find the best resources to help herself get there. I know she credits Michael for helping her reach her goals. The knowledge, support, and expertise at ShapeUp Fitness and Wellness has helped her grow as an athlete and runner and I am so proud of her! !